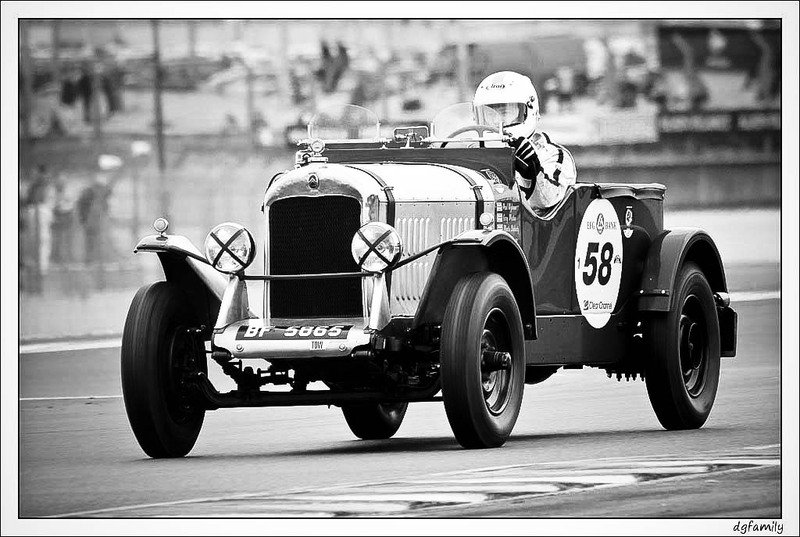 In 1932 Henri de la Sayette entered the first and only citroen to enter the world famous Le Mans 24 hour race. His car was a 1932 Citroen c4 with a special roadster body. Charles Wolf took the start of the race in the car but barely a hand full of laps in the car started to misfire and stop on the way to Mulsanne. 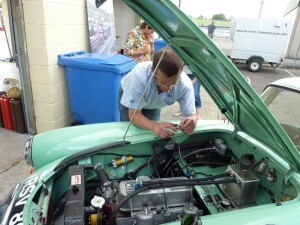 with no tools and spares, although it turned out to be an easily fixed electrical fault there was nothing Charles could do to get the car back into the race. Thats not to say the entry was a total failure, in 1932 32 cars entered the race but only 28 of those actually took the start. At the end of the race only 9 cars were still running at the end of the 24 hours, and the Citroen wasn’t the first to retire. Almost 80 years later after the advent of the Le mans Classic Races Antonia Loysen and Celia Stevens commissioned a recreation of Henri’s car for the 2010 Le Mans Classic. The original car disappeared only a few years after the 1932 race and hasn’t been seen since so is assumed lost. in 2010 The car finished all three of the period one races, and event though the engine was on its last legs the team managed 47th out of 68 on Performance Index and 49th out of 68 on Scratch. 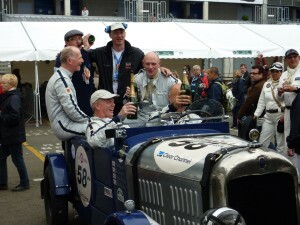 They were also given a special award from Richard Mille for bringing the Citroen back to Le Mans after 78 years. 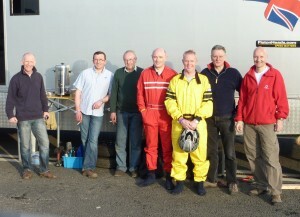 Also at the 2010 event in the grandstands were 4 friends Paul, Martin, Gary and Mike. Mike and Paul had some track day experience but non of them had ever done any racing. A friendly argument ensued about could they come back in 2012 and actually enter the race. The argument resulted in a bet between the 4 friends and the Journey to Le Mans was started. 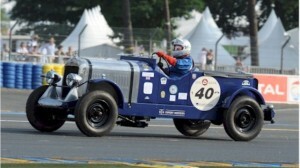 A chance look at an auction listing revealed the Le mans citroen was for sale, The auction wasn’t the best at which to sell a pre war racing car and the group of friends got together managed to buy the car with out any competition. With the car purchased, there was the sudden realisation that they needed to gain international licences which would require an on track test followed by finishing a number of national races in order to gain the required licence level. To do this another car was bought, an MGA. At this point the Guys decided they needed help and really another car to share between the 4 of them whilst they built up their racing experience and to prepare the cars and run the Citroen at Le Mans. 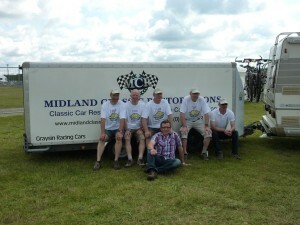 After much searching and meetings Midland Classic Restorations was chosen as the team to prepare and run the cars. MCR would also supply on a hire basis a Sebring Sprite to give the 2nd car needed. All that Paul, mike, Gary and Martin would need to do would be to turn up at the race meetings and get in the cars. 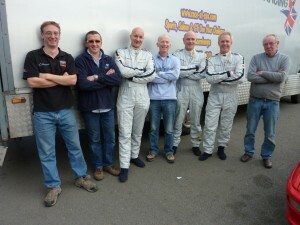 The team would manage the cars and provide instruction , coaching and advice to the drivers. This would be backed up with data from data loggers installed in the cars and Video to review the performance of both cars and drivers each time they went out on track. These are very useful tools to help drivers improve quickly, and also to spot any issues with the cars. Dominic and Graham and the Team took the 4 drivers from novices with very little or no track experience at the start of the year to experienced racers with full international licences at the end of the year. In 2012 the focus was the Le Mans Classic Race, but the Graysin racers still entered some other classic races in the MGA and the Sprite. 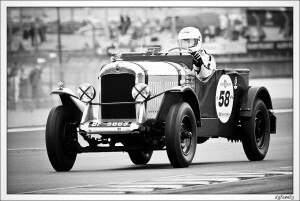 The Le Mans Classic consists of 3 races for cars in each of the 6 time periods from pre war to the 70’s. The races are run over a 24hr period so all the periods get at least one race in the Dark. With four drivers and only a 45 minute race and a mandatory pit stop. 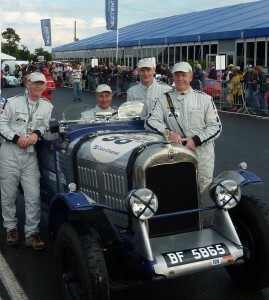 Time was tight with a Lap of the lemans circuit taking over 11 minutes in the citroen. The Driving was split so each race would have 2 drivers in it and each driver getting at least one race. This would also prove to be only the start of the story not the end. They following year the Drivers Moved to FIA appendix K MGB racers also Prepared and run By MCR, whilst the Citroen was refreshed including a full rebuild of the engine this time by the in house team at MCR. On return to the next Le mans Classic in 2014, not only would the team go much faster and complete all the races but they would get the best result for a Citroen at Le Mans Ever.